A long time ago, I read the first two books in the authors series, The Drake Chronicles. I really enjoyed them, but I got side-tracked and forgot to return to the series. Even though it has been a while, I remembered enough to know that I had enjoyed them when I first heard of A Breath of Frost. Regardless, I would have read this book anyway, because I love a witchy story, and have you seen that cover?! It is beautiful! 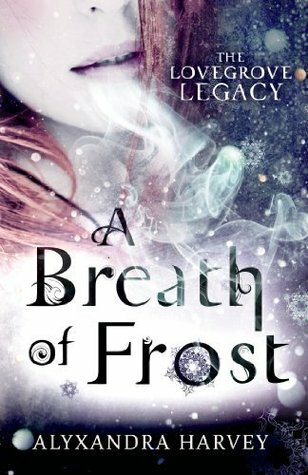 I usually read at least a few reviews for a book before I delve into it, but with A Breath of Frost I decided to go in blind. And I am glad that I did. I absolutely loved this book! It was fun, adventurous, fast-paced! There was forbidden romance, and true friendship and love and good and evil. There was humor, sadness. A mean girl, or two or three. And WITCHERY! A Breath of Frost is set in 1841. It focuses on the debutantes of that time period, who happen to be witches. The main characters in the story are Emma, her two cousins Gretchen and Penelope, and the non-magical Cormac. Emma and the cousins had no idea that they were witches until a certain instance takes place at a ball, and all heck breaks loose. The story really takes off from there, with murdered deb's and evil witches and mean girl deb's. Emma ends up as a suspect, and the story revolves around her trying to prove her innocence. Her and her cousins have to learn to control there recently found powers, and protecting each other from the witching rulers and other not so great things. You will meet Moira, from the "wrong side of the tracks" and Strawberry, Moira's best friend and One-Eyed Joe. Daphne, the mean girl. And many other great characters. I don't want to say much more, because this book..... you just need to read it! Another interesting thing to look for are the familiars. A very cool aspect of the story, and something that every witch has. Think spiders, and deer and wolfhounds! The only issue that I found during the story was the multiple POV's. The POV changes from chapter to chapter, which I enjoyed, but the problem arose when I found the POV switching from paragraph to paragraph and sometimes from sentence to sentence. At the beginning of the story, it was confusing and I was getting frustrated because it would pull me out of the story. But thankfully, Alyxandra Harvey is a master at characterization. All of the characters are very much individuals, with their own voices and quirks. Once I got to know them, the confusion fled and I flew through the story. Other than that, this story is perfection.... for me! I would recommend this book to... honestly? Anybody! I am 31 years old and I loved every page, and I would happily hand it to my 18 year old niece, and she would love it, too. My only warning is that it can get very dark at times, and there is murder of young women. If that isn't something that you enjoy, go into this story with caution. Otherwise, go full steam ahead! I meant to read this back in January and didn't get to it. I'm still planning on reading it though, especially after your review. Thanks for stopping by! I hope that you get to it soon! It completely took me by surprise. I really hope that you love it as much as I did! Thanks for the comment!